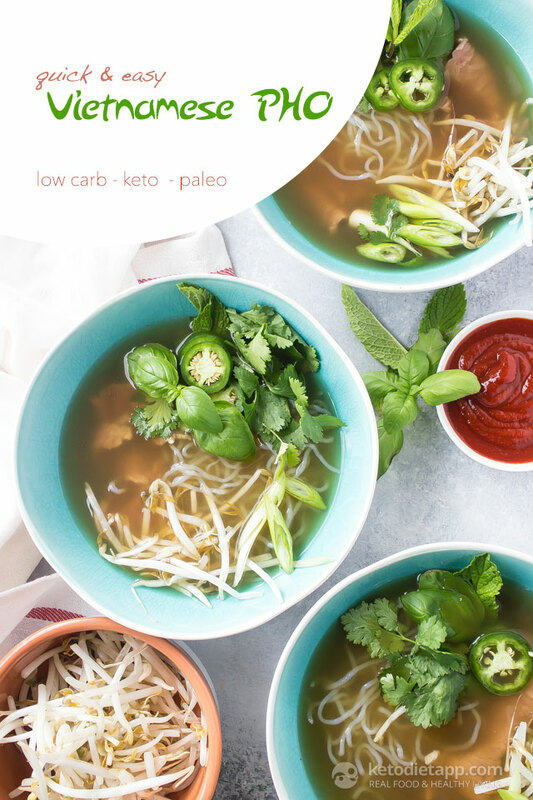 Pho is one of the easiest and tastiest soups to make, it’s incredibly versatile (all those toppings! 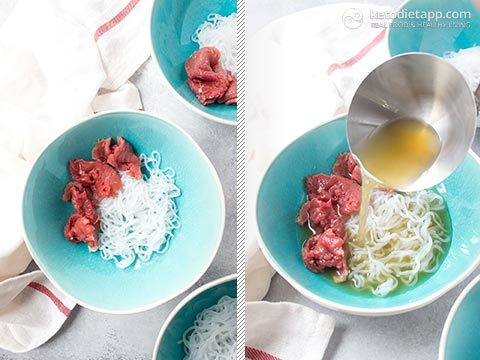 ), and it’s easily made low carb with a simple swap for the typical rice noodles. With this recipe you won’t think twice about the missing starch. 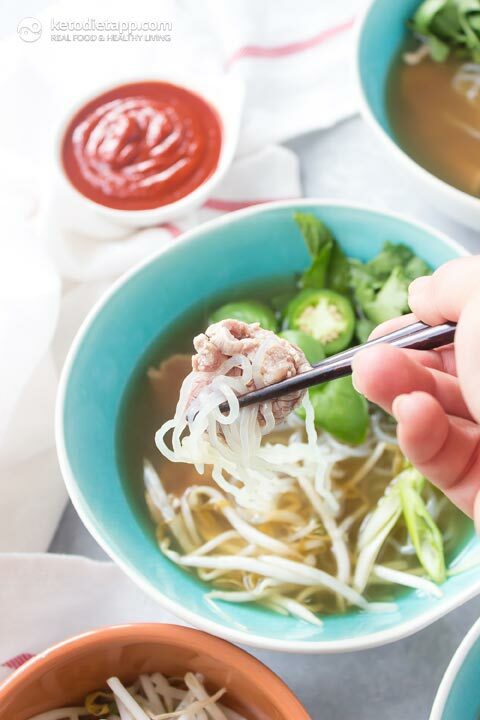 Typically Pho, pronounced fuh, is made with fresh bone broth that boasts numerous speciality spices. We’re scaling the ingredients down to the bare minimum with equally as delicious results and this recipe can be made in 40 minutes! To swap out the rice noodles I’ve opted to use Shirataki noodles. If you’re not familiar they’re a traditional Japanese noodles made from the konjac yam and they’re zero calorie and zero carb. The key is to prepare them the right way and they taste just like regular vermicelli style noodles (you can buy different shapes but I like the vermicelli style), at least to me! Check out this guide on how to prepare them the correct way! My favorite part of this soup is the toppings! 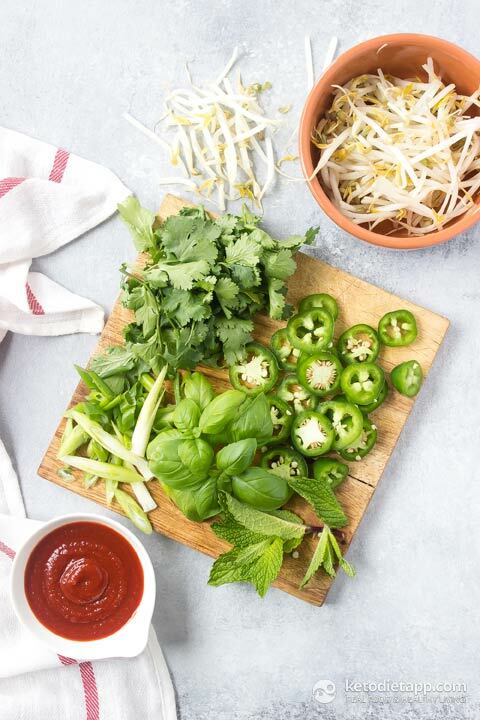 We’ve got bean sprouts, basil, cilantro, mint, green onions, Sriracha, and jalapeños. You can also top it off with a fresh squeeze of lime. Place the beef in the freezer for 20 minutes to make it easier to slice. 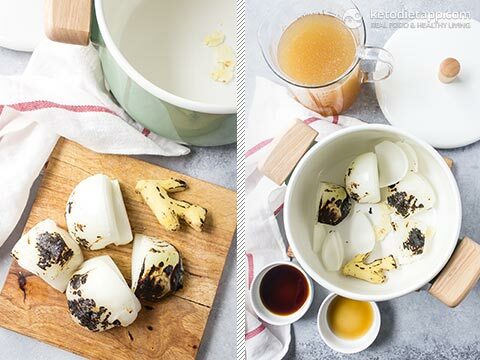 Under a broiler or over a gas flame char the onion and ginger for 5-7 minutes until they just start to blacken. Add them to a large soup pot with the crushed garlic, fish sauce, and coconut aminos. Set the pot over medium high heat and bring to a boil. Reduce to a simmer and cook 30 minutes. 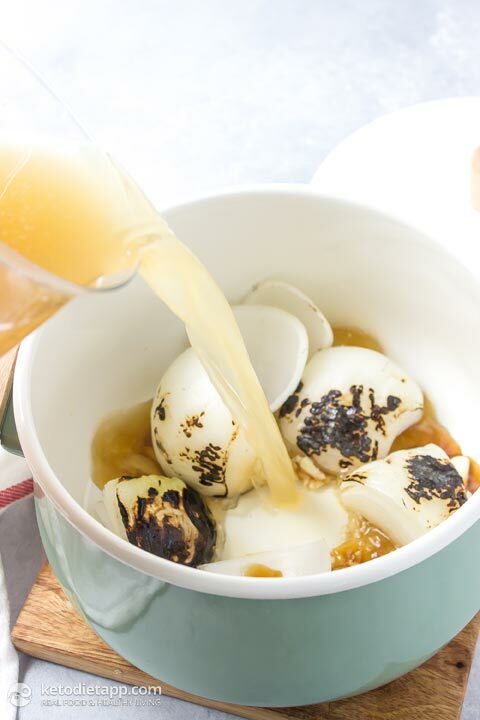 Raise the heat to high to bring to a boil before adding the broth to the bowls. Prepare your toppings and noodles. Follow this guide for preparing the noodles. 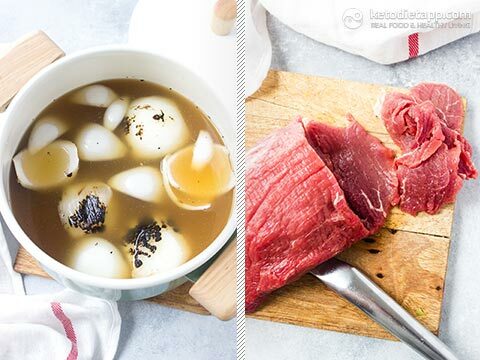 Once the broth has cooked 30 minutes and you have brought it back up to a boil carefully ladle it into the bowls on top of the noodles and beef. The beef should start to turn brown immediately. Top the soup with your desired toppings. Could you please tell me the sodium content of this recipe? I'd like to make it for my mom who has type 2 diabetes, but has had a heart attack, so she has to watch her sodium intake. Thank you! Hi Michelle, the sodium content varies and depends on the stock you're using - I wouldn't want to give you an estimate because I don't know which stock you'll be using and how much salt you'll be adding to it.